Throughout his life, Atlanta resident George W. Wray Jr. (1936-2004) built a collection of more than six hundred of the rarest Confederate artifacts including not just firearms and edged weapons but also flags, uniforms, and accoutrements. Today, Wray's collection forms an integral part of the Atlanta History Center's holdings of some eleven thousand Civil War artifacts. 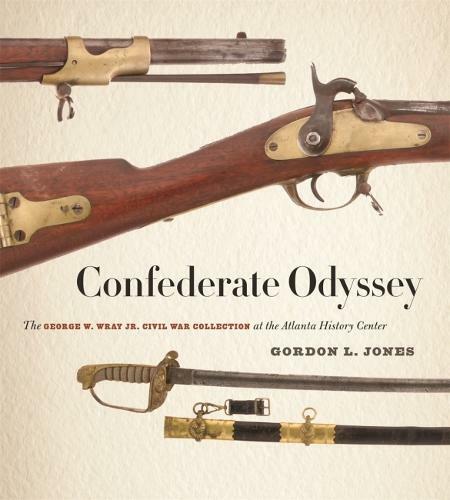 Confederate Odyssey tells the story of the Civil War through the Wray Collection. Analyzing the collection as material evidence, Gordon L. Jones demonstrates how a slave-based economy on the cusp of industrialization attempted to fight an industrial war. The broad range of the collection includes many rare or one-of-a-kind objects, such as a patent model and early inventions by gun maker George W. Morse, the blood-stained coat of a seventeen-year-old South Carolina soldier, battle flags made of cloth imported from England, and arms made in Georgia, the heart of the Confederacy's burgeoning military-industrial complex. As Civil War history, Confederate Odyssey benefits from the study of material remains as it bridges the domains of professional scholars and amateur collectors such as Wray. The book tells of the stories, significance, and context of these artifacts to general readers and Civil War buffs alike. The Wray Collection is more than a gathering of relics; it is a tale of historical truths revealed in small details. There are many, many iconic items that are appealing to the reader. . . . It is a veritable encyclopedia on the arms of the Confederacy and would make for a wonderful addition to the library of the arms collector whether he is interested in the Civil War or the Confederacy.--Frank Graves "Arms Heritage Magazine "
Jones, Senior Military Curator of the Atlanta History Center, has proven himself to be one of today's top authorities of Civil War artifacts . . . The full color photographs were taken by master photographer Jack Melton, Jr., and serve this book well, turning a valuable research tool into a work of beauty. Photos are crisp and numerous for most pieces, and are invaluable for anyone from advanced collectors to armchair historians interested in the Confederacy's struggle to provide needed materials to its troops in the field. . . . This book is first rate in [my] opinion, and deserving of a place on every serious Civil War buff or collector's book shelf.--Butch Holcombe "American Digger "
[A] richly illustrated story of the South's war effort told through one of the world's finest collections of artifacts. . . . This stunning coffee table sized volume shows over 600 of the rarest Confederate artifacts.--Doc Kirby "Book Bit for WTBF-AM/FM "
The Wray collection encompasses some 1,300 artifacts, of which approximately 600 are described in this catalogue. The Wray collection's scope expresses in a material way the saga of the Confederacy, its strengths, innovative creativity, and its ultimate falling short of its goal of Confederate self-sufficiency and independence.--Bruce S. Bazelon "Blue and Gray Magazine "